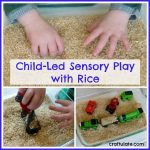 Back in April we took part in another of these challenges, using rice. 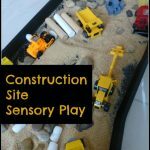 This time we played with sand – well actually it was a mixture of sand and old pantry grains left over from our Construction Site Sensory Play that we did nearly a year ago! 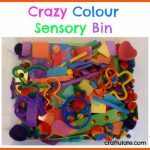 The idea of the challenge is to just provide the child with the sensory material, and let them play with it however they wish. 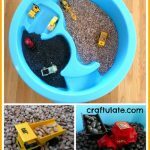 I placed the sand and grains in a large cookie sheet and invited F to play. 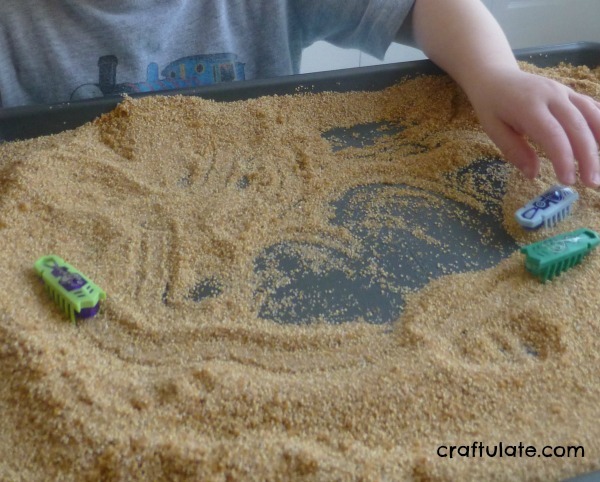 At first he tested out the sand by grabbing handfuls and letting it fall back into the cookie sheet. Then he asked for a stick (actually a single chopstick) so he could draw squiggles and letters in the sand. 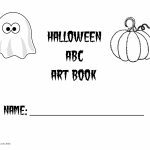 This wasn’t too much of a surprise as we had done this a few days earlier for some alphabet writing practice. 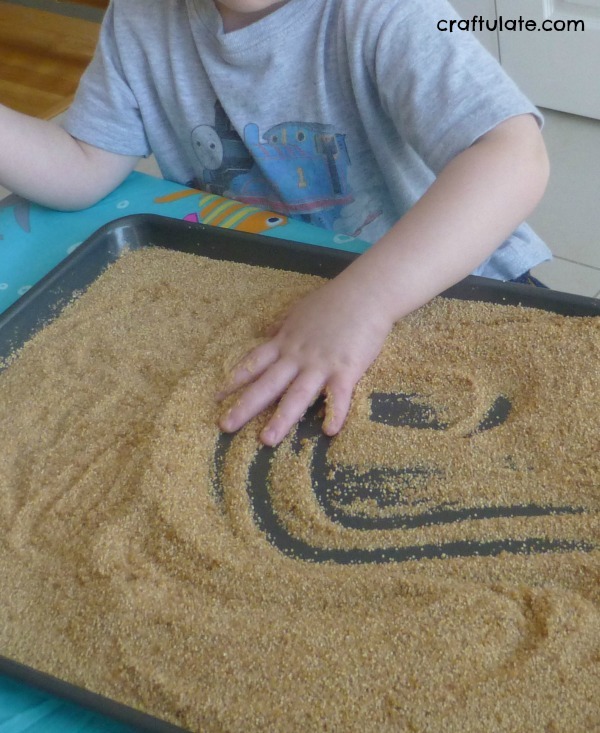 After drawing with the stick for a while he swooshed his hand through the sand to see the effect. Then he asked for some bugs. I thought he meant plastic bugs like we used in our Bug Slime, but no, that wasn’t right. He ran off to get his Hexbugs! Hexbugs are little robotic insect toys that we recently used for Painting (seriously cool!) – so I guess he was sort of recreating that with the sand. The Hexbugs got stuck a lot in the bigger mounds of sand but he still found it fascinating to watch. Just as I was thinking that this might spark a whole new activity if we did it again with less sand, we discovered that little bits of sand were working into the on/off switch of the Hexbugs, so we decided to take them out. But F wasn’t finished with this sand yet. He went and grabbed his tractor and wagon and at this point I knew things would get a little messy. But I pretended to be super-cool mom and not wince every time the sand hit the floor. He asked for a cup and I gave him a teeny tiny one. He tried making little sandcastles but the sand was too dry, so asked for some water. ARGH! But no, super calm me came up with a genius idea (if I do say so myself) to limit the water – by giving it to him in a spray bottle! 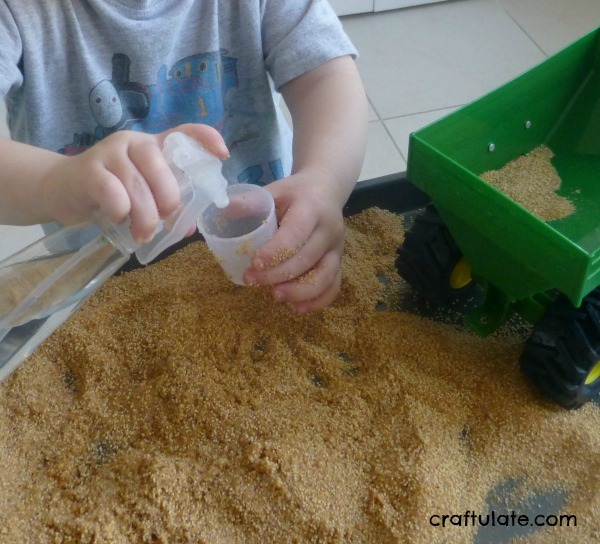 He enjoyed spraying the water (great fine motor practice) both onto the sand and into the cup. Then it was back to the tractor. 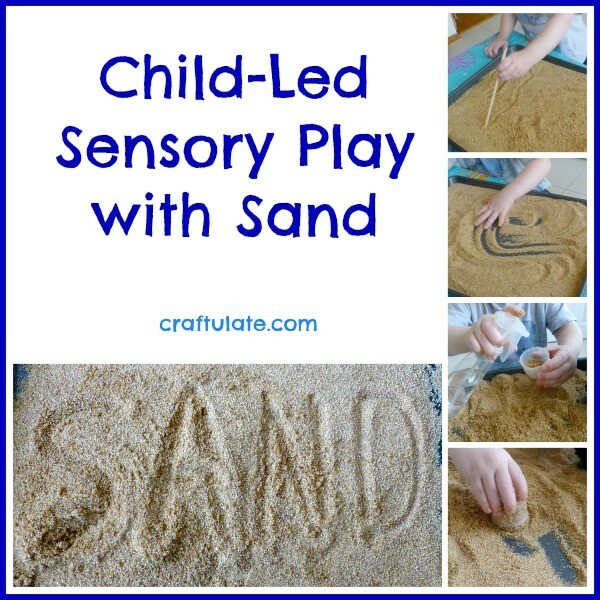 With damp sand. Which didn’t stick to the tractor at all. Absolutely not. Overall I was pretty pleased with how this activity went, and how F brought in elements from previous activities. Yes, sand did spill onto the table and floor, but clean-up was actually pretty quick.